After a breather of a few years, AFV Club has once again done a new version of the later production American light tank family and has now provided us with a super late-production variant of the M5A1. With this kit and the announced M8 75mm HMC kit on the way, they are only lacking the M5 light tank to “complete the record” on the later production radial engined tanks. 99 new or modified parts have been added to this version of the kit. As with the previous kit from early last year, it uses only the essential sprues from the M3A3 kit from 2002 and even those have been touched up. These specifically cover items like the new mounts and VVSS springs for the idler wheels - but being AFV Club, they provided nylon inserts so the “springing” action works! Go figure. The modeler also has a choice of either welded spoke road wheels or the welded “pressed steel” types (two versions and including separate grease caps), as well as welded open spoke or “patched” spoke idlers. The lower hull is molded flat, but this is not a major problem as it actually permits more accurate construction of the hull. The hull also comes with a firewall and mounts for the twin fans at the rear of the compartment, but no engines or any other lower hull innards are included. The crew escape hatch is also a separate component. The engine access doors come in six parts – two folding sections and two fixed sections. Fenders and the rear section of the sponsons are separate parts, and the lower glacis is also provided with separate bolt heads molded on one of the sprues for accuracy. This kit also comes with the later air deflector package for the rear of the hull as well as the grilles for earlier production. The upper hull comes in a total of six basic parts – upper sides, upper glacis, turret roof, fuel tank covers, and engine deck. The bow gun is mounted so that it can move and all of the hatches and periscope inserts are separate components, and if carefully assembled the directions also indicate the hull periscopes are moveable. Brass parts basically cover all of the big grilles at the rear for the upper air intake and exhaust vents from the engine compartment and this time it includes the lower grilles as well. The turret comes with a complete 37mm gun and a turned aluminum barrel (no plastic option.) A few other interior parts are included to include an SCR-508 radio set for the turret bustle (no No. 19 set is provide for the Stuart VI, so Commonwealth modelers are on their own here.) Two different sets of turret moldings are provided for the M5A1 turret - with or without the bulged shield on the right side. There are some small ejection pin marks inside the turret but nothing of major note most places. Note the grousers are quite accurate but come in two pieces each, and since there are 24 of them this may be the most tedious part of the kit. Apparently the “H” flag on the directions means “alternate” as the grousers require alternating installation to fit correctly (upper and lower flanges). The kit includes the late model sand shields complete in components so they can be installed or “left off” as desired, and also provides a “Cullen Device” for the bow of the tank. It also comes with the rear basket to include a section of etched brass mesh for the bottom of the bin. 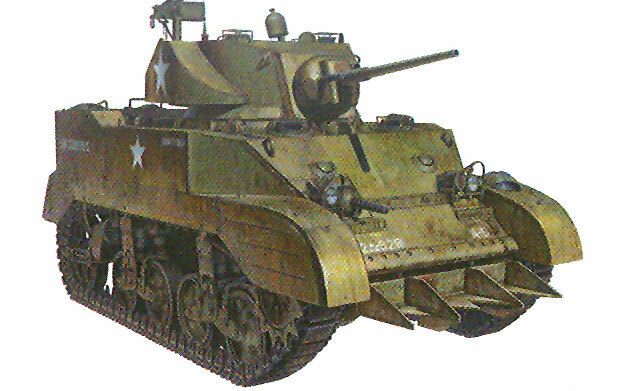 AFV Club offers five finishing options: 4th Battalion, the Armor Brigade, ROC Army, Taiwan, January 1952; “Fish ‘n’ Chips”, 83rd Reconnaissance Battalion, 3rd Armored Division, Belgium 1944 (mislabled as “113th Cavalry Regiment”); “Shanty Irish”, 92nd Reconnaissance Battalion, 12th Armored Division, Germany, March 1945; 24th Armored Regiment, 1st Division Blindee, Belgium 1944; and “Sloppy Joe”, 92nd Reconnaissance Battalion, 12th Armored Division, Germany, January 1945. Overall this kit is the “bookend” to a collection of American light tanks, and now AFV Club only needs to produce the M8 and M5 to finish off the later models. Thanks to Miin Herng Tsueng of AFV Club for the review sample.